Dario Franchitti had a moo-ving experience after winning the 2007 Indy 500. 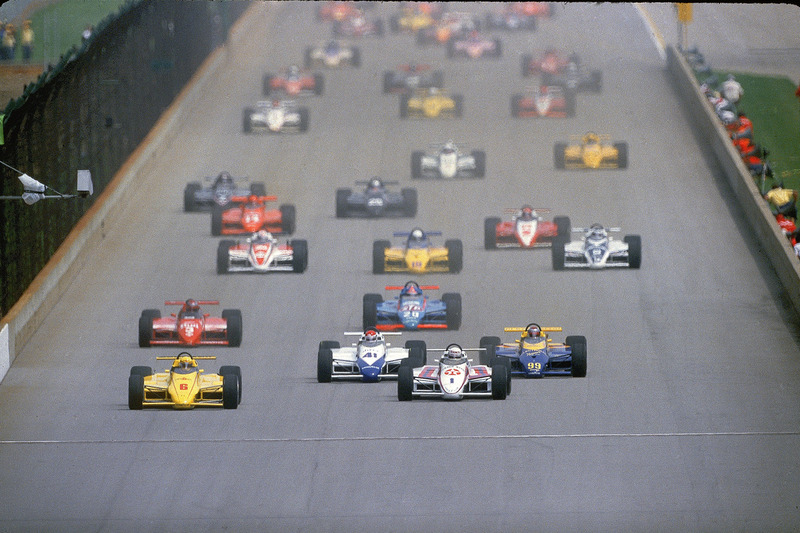 An AP poll of 27 Indy 500 champions revealed that moo juice is the race's finest tradition. 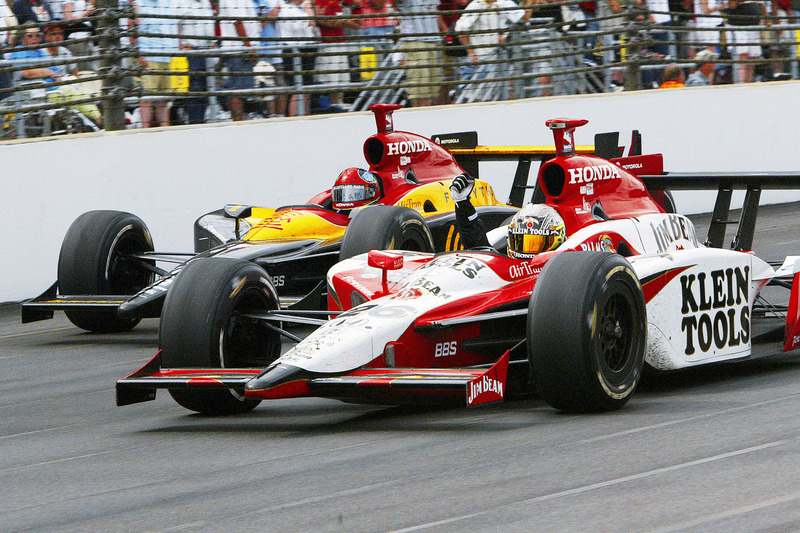 INDIANAPOLIS (AP) — Sam Hornish Jr. remembers every moment from his Indy 500 victory as if they were snapshots in time. His aborted pass of Marco Andretti with just over a lap to go. His successful pass just yards from the finish line. His team pushing his Penske Racing car to victory lane in the race he'd always wanted to win. And he remembered taking a swig of milk and pouring it over his head. In the lead-up to the 100th running of the ''The Greatest Spectacle in Racing,'' The Associated Press interviewed the 27 living race winners on topics ranging from the greatest driver to most memorable moment. Hornish and 12 others called the milk the race's greatest tradition, while seven chose the singing of ''Back Home Again in Indiana.'' 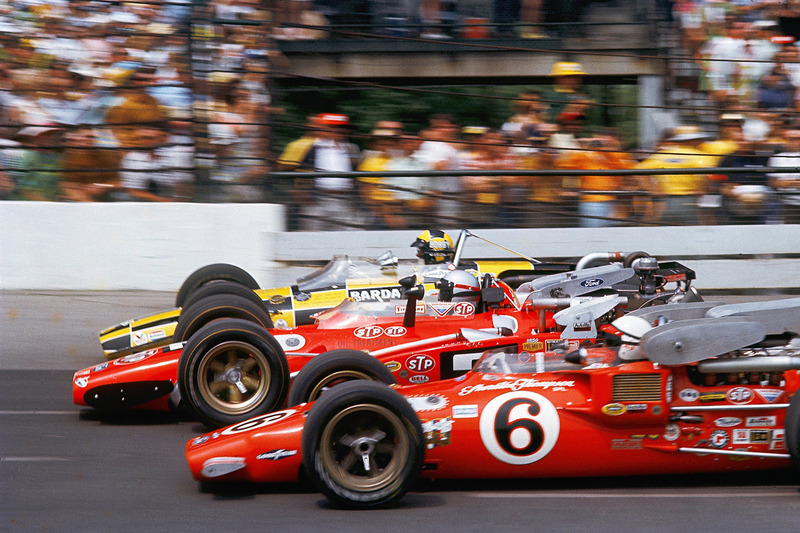 Others chose the Borg-Warner Trophy and the iconic three-wide starting grid. Why was the milk such a popular pick? 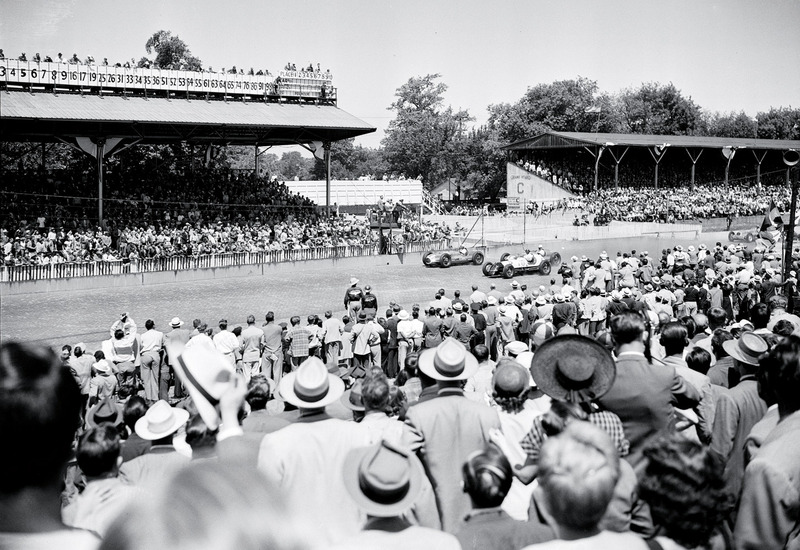 The tradition dates to 1936, when Louis Meyer won his third and Indy 500. Meyer professed to drink buttermilk to refresh himself on hot days, and a photographer captured him guzzling from a glass bottle in victory lane. The picture showed up in the newspaper the following section, and an executive representing milk producers vowed that the winner would continue to drink it in future years. Beginning with Pat Flaherty in 1956, that has been precisely the case. 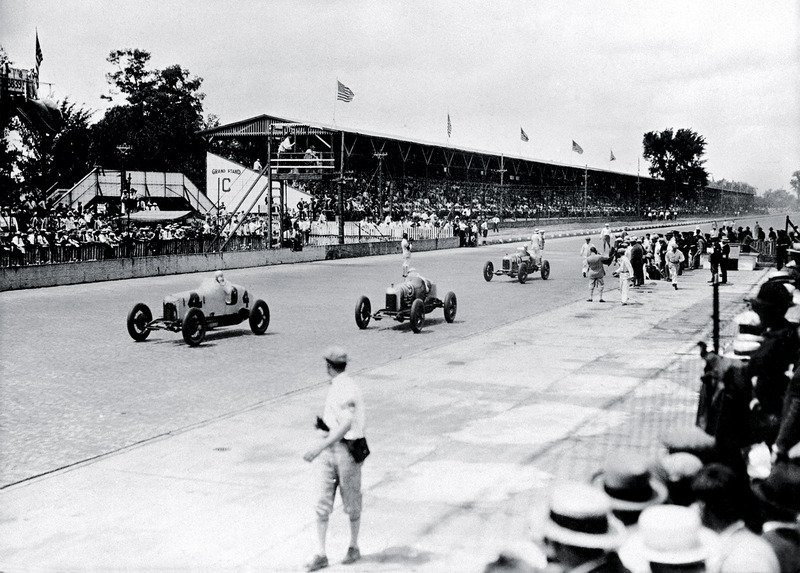 The lineup for Indy's first 500-mile race was led by a convertible pace car (lower right). The photographer? Yes—it's Mr. Henry Ford. 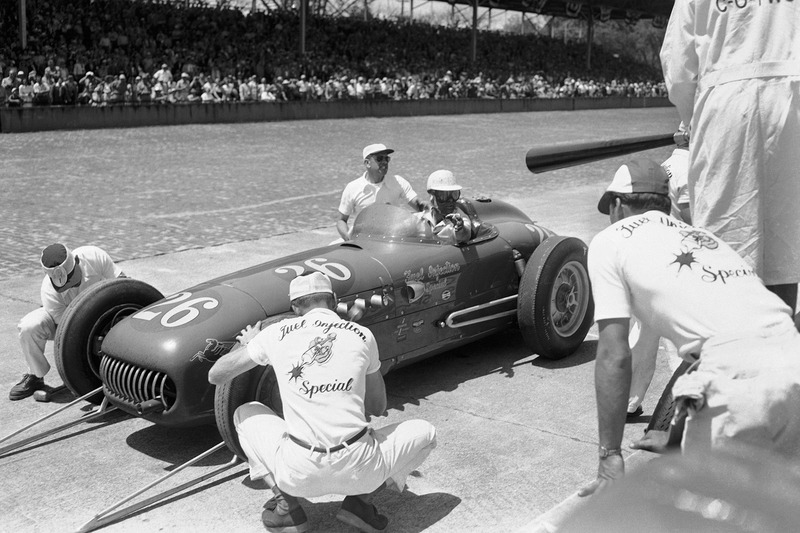 Billy Knipper (10) passed Billy Liesaw (17) and Bill Endicott (33) as they pulled over to pit. Liesaw, though, wound up the fastest of the Billys, finishing 14th. Fans were still milling around their own cars in the infield as pole sitter Tommy Milton led the field past the starting line. 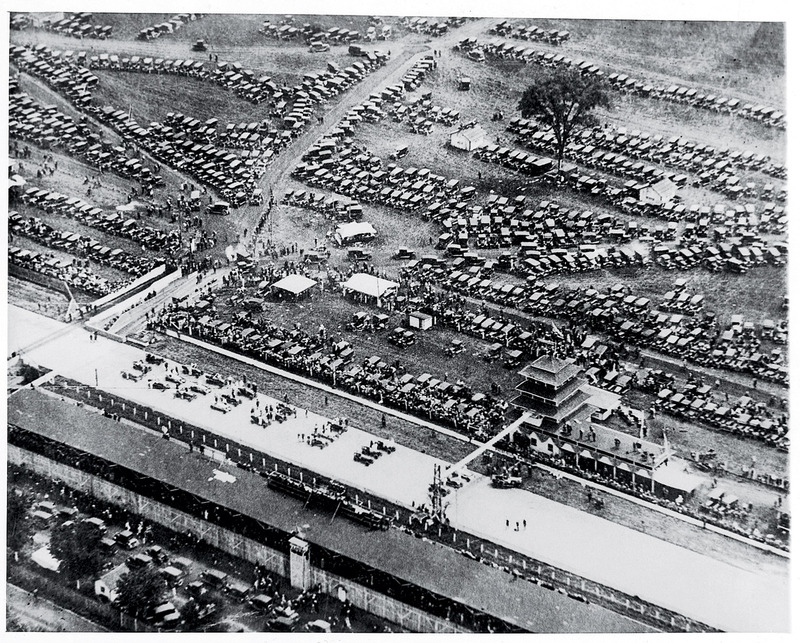 The track isn't the only place to find cars during a race: In the Roaring '20s fans parked their Model T's in the infield. Back then the racing surface exposed a while lot more than a yard of bricks-repaving in asphalt was still a decade away, as was swigging dairy for champs. Rookie Louis Meyer, who would later start the ritual when he became the 500's first three-time winner, was a milkless victor in '28. 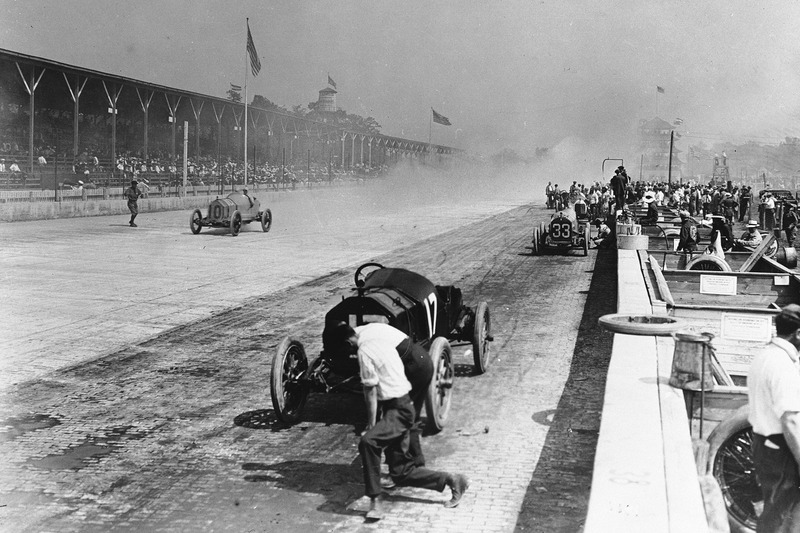 The "paddock" overlooked this straightaway, and in a messy race Billy Arnold broke an axle, Wilbur Shaw went over a wall and Louis Schneider won. With no traffic to challenge Floyd Roberts at the finish, the started signaled his victory while moving safely toward the middle of the track. Crowds came out in full force (as well as in full headgear) and saw Mauri Rose win his third, and last, 500. Rose's car is far left at the starting line. 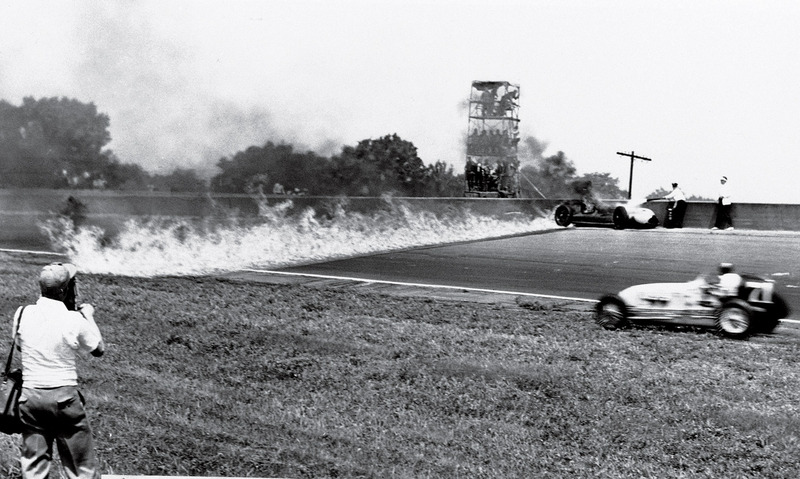 Norm Houser took an infield detour to dodge the trail of fire left by Duke Nalon's crash into the retaining wall. Nalon's injuries knocked him out of racing for two years. The chassis were different, but the engines remained the same. Troy Ruttman and Rodger Ward pitted a 1952 Kuzma and a '59 Watson, respectively, to tune up their Offys, while Sam Hanks, behind the wheel of a Salih in '57, safely revved his around a retaining all. Another thing they all had in common: They won their races. Despite the high casualty rate on the track crowds continued to turn out, enthralled by the ever-increasing speeds of roadsters roaring round the bend. 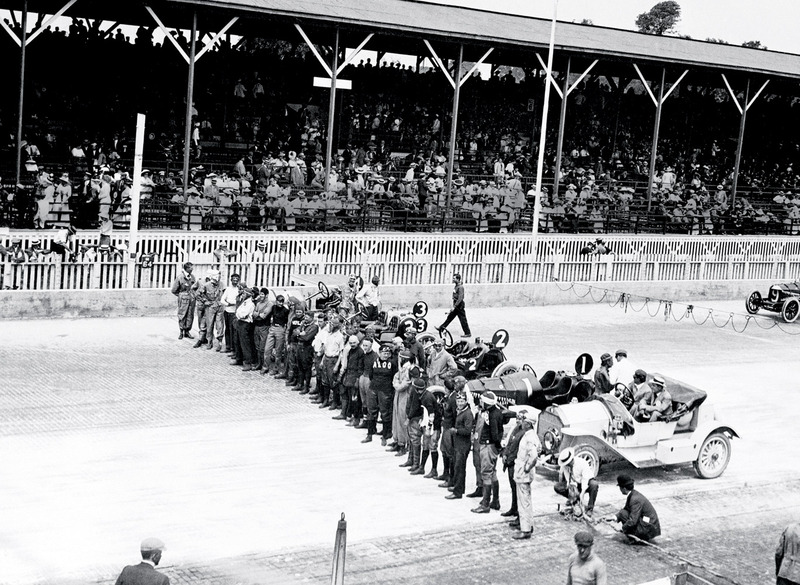 Black clouds of gloom hung over the Speedway after the deadly '64 crash, the first time the Indy 500 was halted for an accident. The second was two years later, when no one died, but rookie Jackie Stewart endured heartbreak; he led 40 laps before late mechanical failure ended his title hopes. Although he was flanked by past winners Bobby Unser and A.J. 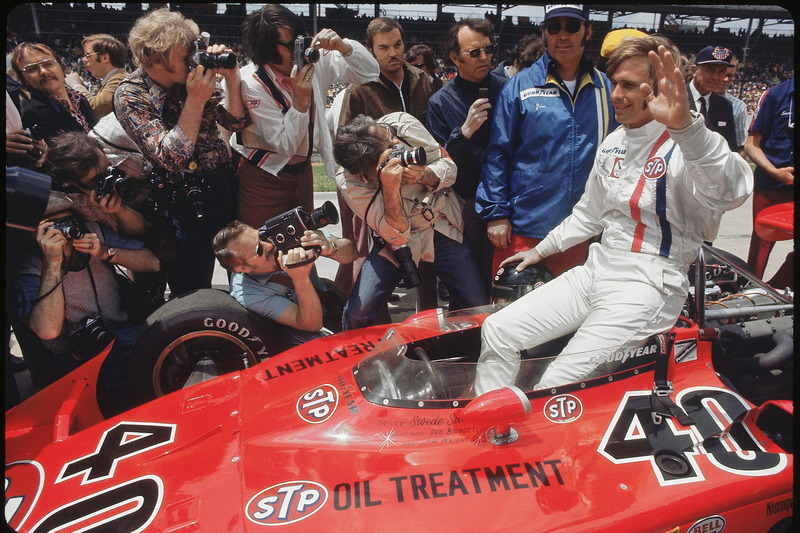 Foyt (6) at the start of the race, Mario Andretti prevailed to take his first and only checkered flag. Swede Savage was already a darling at Indy, a sunny 26-year-old out of California with loads of speed. He had driven his Eagle-Offenhauser to a qualifying record of 196.580 mph when these photographers descended. 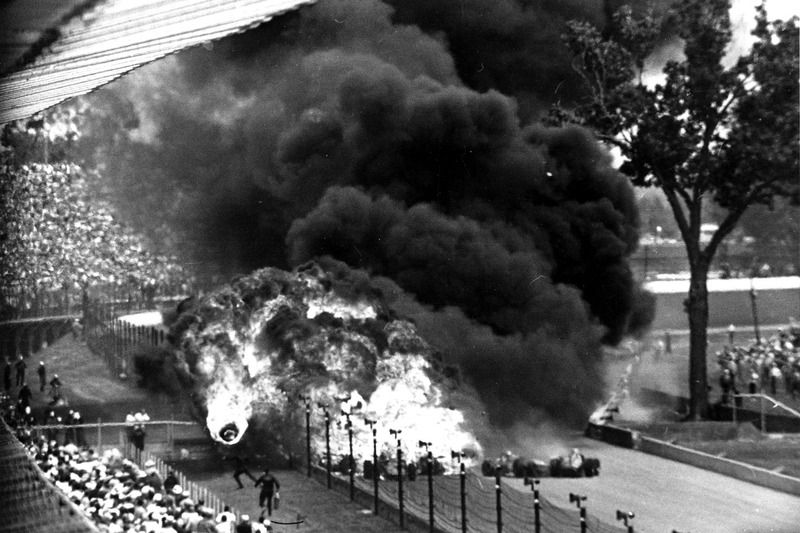 Two weeks later, in the 500, Savage was battling for the lead and carry a full tank of gas when he crashed into the inside wall and was thrown, engulfed in flame, across the track. He died 33 days later. 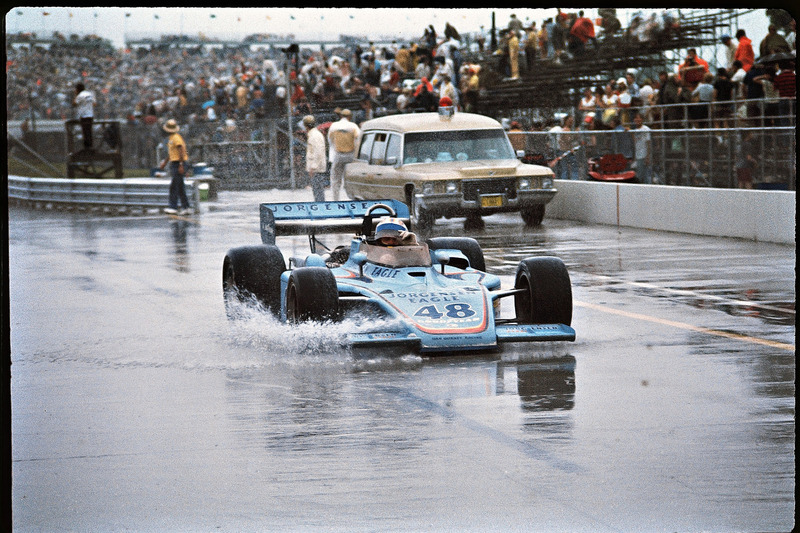 Not to be outdone by Al's two titles, Bobby nabbed his splashy second victory after he was leading on the 174th lap and the race was declared over on account of rain. Starting from the third position, Mears (6) led the field fro 119 of the 200 laps, his only Indy victory that did not start from the pole. He won a record six poles at Indy. 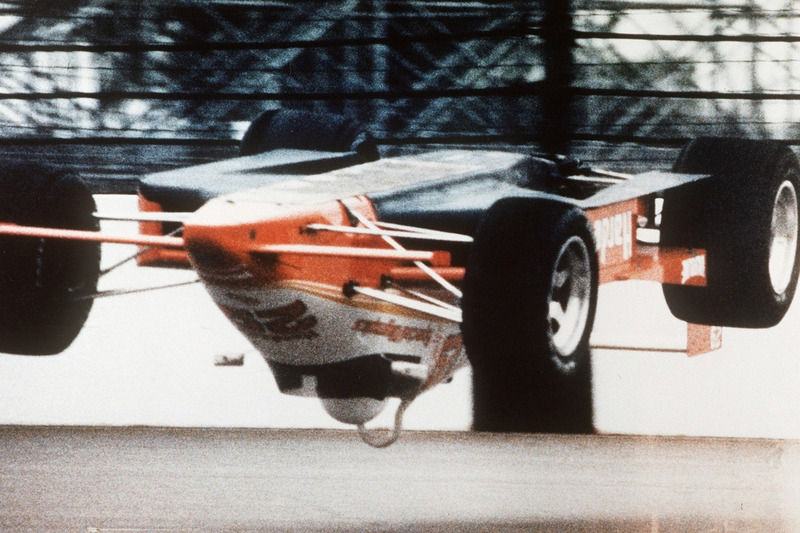 Pancho Carter flipped head over tailpipe in practice, sliding on his head for more than 800 feet. Uninjured, he raced (with a new helmet) three weeks later, finishing 27th. 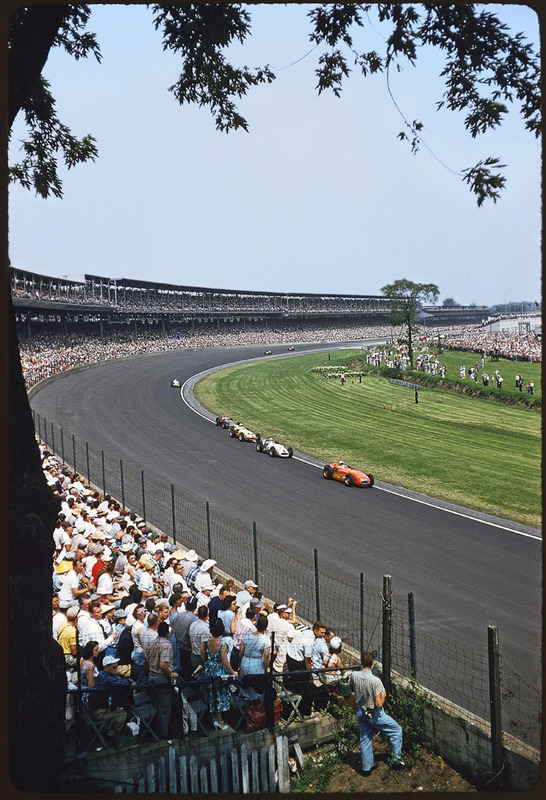 Boycotted by many drivers, the first postsplit 500 retained some golden rules-slow down to avoid debris and don't follow the rubber to the wall. The annual tradition of getting the 500 underway by releasing some 30,000 helium-filled balloons (just as the last note of Back Home Again in Indiana is sung) presaged a paradoxical race. It was once full of no-names (many top drivers were in CART) and incomparably rich. 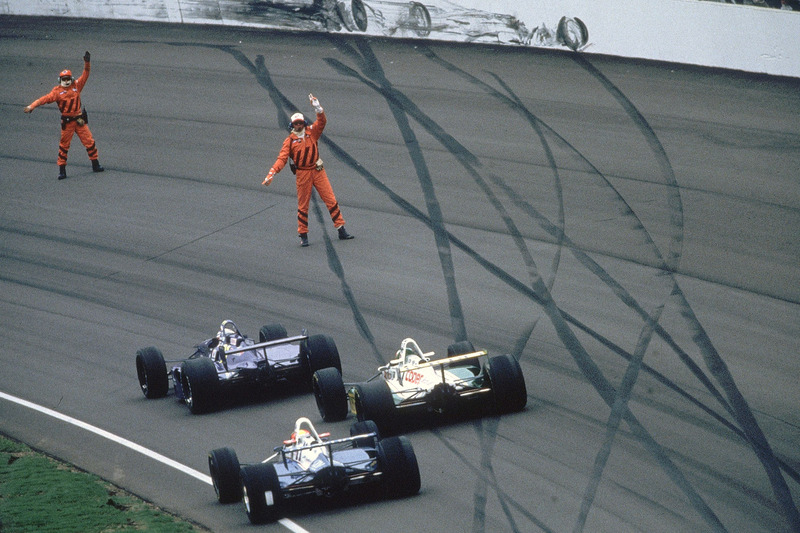 The biggest chunk of the record $8.7 million purse went to winner Eddie Cheever Jr., who came from the 17th position for his only 500 victory. 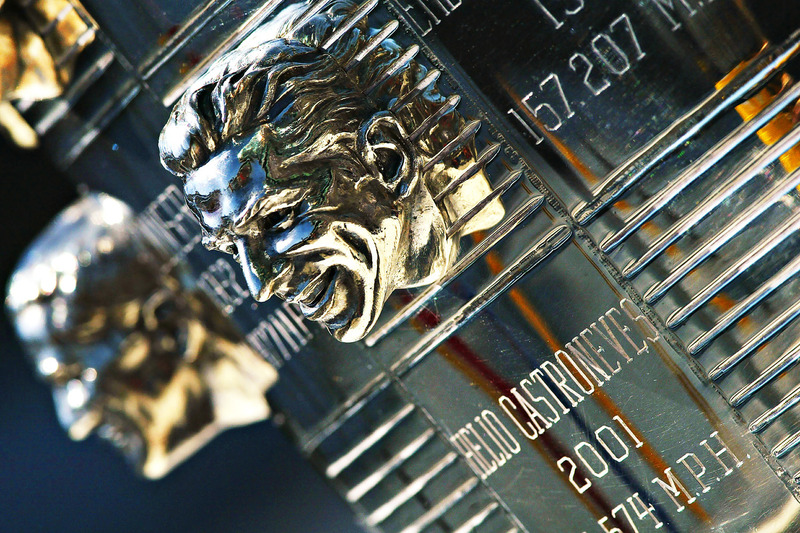 When Helio Castroneves became the eighth rookie to win the 500, his smiling mug was immortalized in sterling silver alongside every winner since 1936. The 75-year-old Borg-Warner Trophy weighs around 110 pounds and stands about 5' 5", so it's no small thing to hoist. It's also valued at $1.5 million, a nice sum but not as valuable as winning the Indy 500: That, as any driver would say, is priceless. Dan Wheldon, shown here, won the Indy 500 in 2005, marking the first time an Englishman won the storied race since Graham Hill's victory in 1966. In 2011, Wheldon tragically lost his life in a 15-car accident at the IZOD IndyCar World Championship at Las Vegas Motor Speedway. No good tradition is without colorful stumbling blocks, though. Emerson Fittipaldi famously broke from custom in 1993 when he instead drank orange juice (the Brazilian owned several groves). Despite having a sip of milk after the TV cameras had left, Fittipaldi was chastised for the faux pas for years. These days, the American Dairy Association compiles a list of what type of milk each driver requests before the race. Some choose skim, but whole and 2 percent are the most popular varieties. 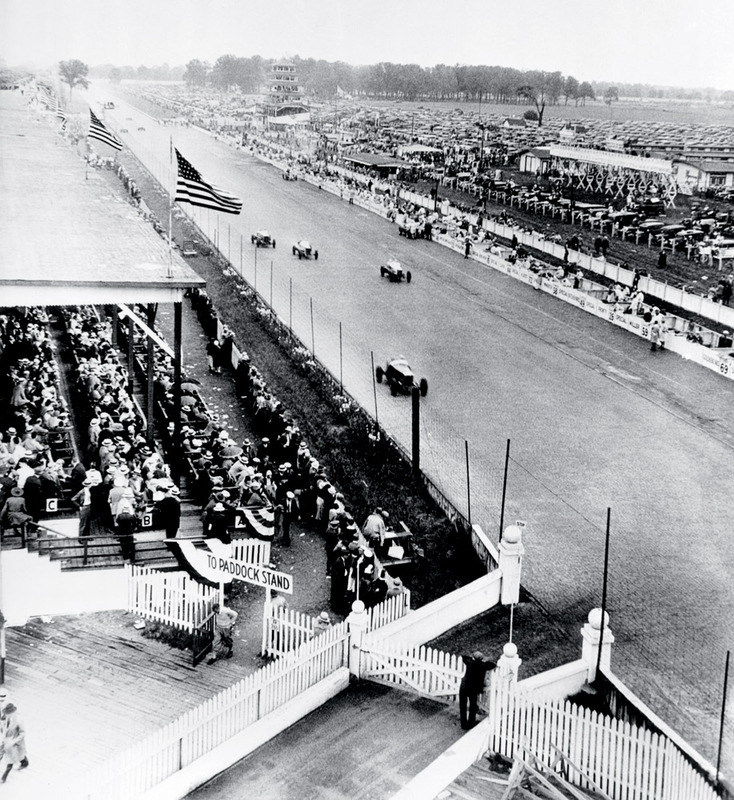 Originally played by a trackside brass band in 1917, the song became the unofficial anthem of the Indy 500 beginning in 1946. And while Mel Torme and Dinah Shore are among those who have led the singing, it is the baritone voice of Jim Nabors that became synonymous with it. Nabors sang it every year, with just a few exceptions, from 1972 until 2014. 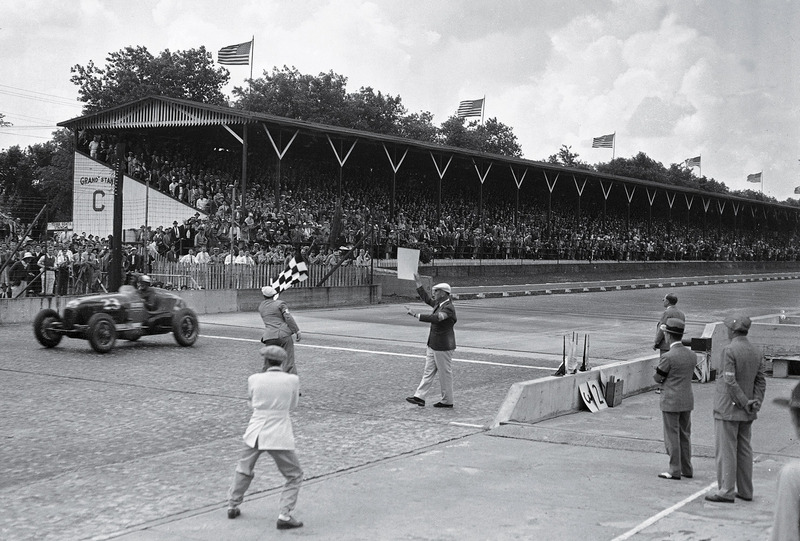 The silver trophy, permanently housed at the track museum, was first awarded in 1936. The face of every winner is sculpted onto it in bas-relief, and their name, year and average speed are also inscribed. Winners later receive a smaller replica, a ''Baby Borg,'' to keep. Gordon Johncock and Tony Kanaan both called the Borg-Warner the Indy 500's greatest tradition. 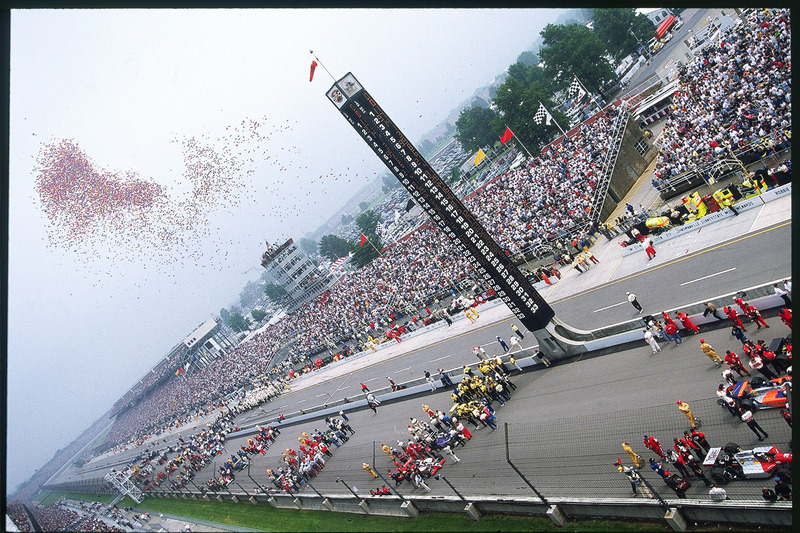 Johnny Rutherford called the release of thousands of balloons, first done in 1947, his favorite tradition, and some mentioned the three-wide starting grid. Others mentioned the late public-address announcer Tom Carnegie's call of a new track record as an indelible part of the Indy 500.